Kara Sainz appeared most recently on Highlight Show 27 as well as on Show 274, recorded in June 2013, at age 20. 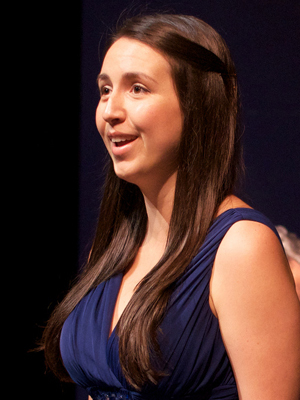 Kara Sainz (mezzo-soprano) first appeared on From the Top as a soloist in 2010. Originally from Temecula, California, she is a rising fourth year undergraduate student at The Juilliard School, where she is a recipient of the Jerome L. Greene Fellowship and a student of Edith Bers. Kara was awarded the ASCAP foundation’s 2010 Lieber and Stoller Scholarship as well as a Grand-Prize Finalist Award in the coveted Los Angeles Music Center Spotlight Awards in 2008, for which she performed in the Dorothy Chandler Pavilion. This summer Ms. Sainz will return to Aspen Summer Music Festival to perform the role of La Ciesca in Puccini’s Gianni Schicchi. Kara is a Jack Kent Cooke Young Artist.